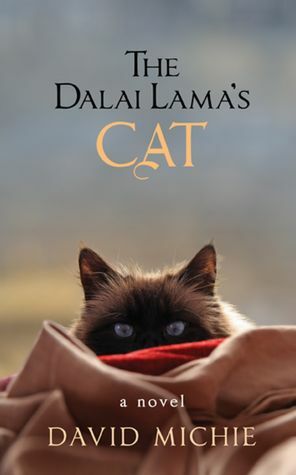 If I had to summarize The Dalai Lama’s Cat in just a few words, they would be “Buddhism 101, brought to you by an adorable cat.” But these few words wouldn’t do this charming book justice. While this warm-hearted story of a small kitten rescued from the slums of New Delhi through fortuitous circumstances may be a little contrived, it’s also utterly delightful. When the Dalai Lama, who is on his way home in a limo, having just returned from a trip to America, sees a kitten being thrown into the gutter, he dispatches a staff member to rescue the kitten. If you’ve ever wondered what it would be like living with the Dalai Lama, now you’ll be able to find out. Through the cat’s eyes, and narrated in her voice, the reader gets a close up view of the Dalai Lama’s inner sanctum and household. Much loved and spoiled by the Dalai Lama and his entire staff, Mousie-Tung, also known as HHC (His Holiness’ Cat), and dubbed “Little Snow Lion” by the Dalai Lama himself, encounters Hollywood stars, Buddhist masters, famous self-help authors and many others who come to visit His Holiness. The little cat soaks up the Dalai Lama’s teachings simply by being in close proximity to his light. I thoroughly enjoyed this book. I’ve read numerous books about and by the Dalai Lama over the years, and I had the good fortune of hearing him speak twice. The first time, I saw him appear at Washington National Cathedral on the first anniversary of September 11. I stood in line for several hours with hundreds of others, under a blue September sky eerily reminiscent of the original 9/11, in a city that had been attacked that day, a year earlier. And yet, there was no fear or worry in that line. Everyone was excited about getting to see the Dalai Lama. When I finally made it inside the cathedral, I was far far in the back – but yet, I felt what so many people report after they’ve been in His Holiness’ presence: an incredible feeling of peace, a sense of love and compassion radiating off of him, and his immense joy in every single moment. My second encounter with the Dalai Lama was a few years later, when he was speaking in a DC sports arena. That time, I sat only a few rows away from him. The experience was similar to the first one, but the closer physical proximity made it even more powerful. David Michie’s portrayal of the Dalai Lama adds a dimension of ordinary “humanity” to this global icon. Through Mousie-Tung’s eyes, the reader gets to see this kind, compassionate and brilliant man go about his every day business. His interactions with the cat thoroughly charmed me. Throughout the book, as Mousie-Tung tells her story, the reader gets introduced to some of the basic concepts of Buddhism. And who better to explain these teachings than a cat? Those of us who have opened our hearts to the many lessons cats teach us won’t find it much of a leap at all to believe that cats are indeed “boddhicatvas,” as Mousie-Tung calls herself (in Buddhism, a boddhisattva is an enlightened being). If you’re interested in learning more about mindfulness and other Buddhist principles, this is an easily accessible way to do so. If you believe that cats have many lessons to teach us, reading this enchanting book will be a transformational experience for you. “Most interesting, my little Snow Lion,” the Dalai Lama remarked after a while, as he closed his book and came over to stroke me. Closing my eyes, I purred. David Michie is the author of Buddhism for Busy People, Hurry Up and Meditate and Enlightenment to Go. For more information, please visit DavidMichie.com. This book was sent to me by the publisher. Receiving the complimentary copy did not influence my review. Book Review and Giveaway: Making Rounds with Oscar by David Dosa, M.D. Thank you so much for your most generous review of my book – I sincerely appreciate it. As a cat lover myself I am so glad that you responded in just the way I had hoped – in fact, even more enthusiastically than I could have hoped! I am also most grateful to you for helping bring the book to wider attention. Trying to launch a little book like this into such a noisy environment is a challenge – and I am truly thankful to you – and also Layla – for your warm hearted support! Sounds delightful! I’ve added this to my wish list, but might have to just buy it for myself as an early holiday celebration. I think this book would make a purr-fect early holiday gift, Peg! I had to skip over and sign up to win the book. Loved your review and thanks for the heads up on the drawing still open! I’m glad you enjoyed the review, Fisher. We knew you’d love it!!! Are you doing a giveaway? We’re giving away five copies of the book this Sunday. It is a wonderful book, Layla. I’m reading it right now Ingrid and it is indeed wonderful! I think you’ll enjoy it, Debbie! Ok, you will understand that i didn’t read the review because I am DYING to read this book!!! In the event I never get it I will go back and read….I promise! You’re too funny, Caren. Most people read reviews to decide whether they want to read a book! 🙂 You’ll love this one.